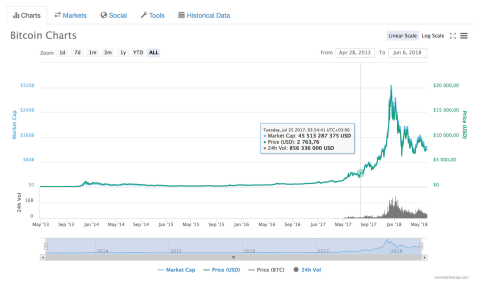 Why the Bitcoin Price Is Volatile and Going down? LandOfCash Forex Forum » Forex Talks » General Forex Discussion » Why the Bitcoin Price Is Volatile and Going down? The Bitcoin price is extremely volatile and quite a lot depends on supply – demand of the Bitcoin and generally cryptocurrency. More demand impacts the price of Bitcoin, which starts to go higher quickly. As more people decides to sell Bitcoin or generally cryptocurrency – price becomes more volatile and going down extremely quickly. For sure sometimes it is difficult to predict Bitcoin price, but its volume depends on global international relationship, have been going on in the world, particularly in Asia right now. Recent volatility is considered to be connected with the major Chinese decision massively to block exchanges, trading operations and ICO already adopted in 2017, which made huge slump and unpredictable negative consequences for the cryptocurrency in the world. Taking into account geopolitical relationship between China and South Korea, including but not limited with Chine’s sanctions towards South Korea, constant sea territorial disputes and final contractual relationships between countries, South Korea decided to follow China in cryptocurrency issues, threatening to ban all cryptocurrency and remove exchanges. It seems to be hugely connected with big investments to cryptocurrency from the South Korean’s citizens as a method to secure their future and make it more comfortable with new digital currency. However the abovementioned reasons cannot be considered as an exhaustive list of reasons.
" Bitcoin volatility is connected in major way with major globalization processes in the world as well as legal regulations and taxation burden, putting owners’ of Bitcoin and other cryptocurrency under the strict regulation and taxation. " * Indian Finance Minister restricted the legal use of cryptocurrency. * Facebook banned the ads for Cryptocurrency and ICOs. * JPMorgan Chase & Co., Bank of America Corp AND Citigroup Inc also halted the purchases of Bitcoin and other cryptocurrencies on their credit cards. * Japanese Cryptocurrency Exchange CoinCheck also get Hacked and $530 Million NEM got stolen. I suppose, having known above mentioned data you just cannot believe in the negative predictions and prognosis, circulating from time to time around Bitcoin. Need to remember that massive volatility of Bitcoin nowadays is temporary phenomena (Bitcoin has an extremely wide and deep potential), which sometimes can be caused even with little act of well-known person, such as, for example, Steve Wozniak investments in cryptocurrency, impacting the Bitcoin’s volatility and resulted in its price growth, nevertheless that for Steve it was just matter of experiment and testing.